What DID the crashers talk about at the salon? Two hair stylists from a fashionable salon appeared Tuesday at the federal courthouse as part of a grand jury investigation involving the couple who got into a White House state dinner without an invitation. The grand jury appearances by Erwin Gomez and Peggy Ioakim covered their conversations with Tareq and Michaele Salahi the day of the Nov. 24 dinner. "They answered questions truthfully and to the best of their ability," their attorney said afterward. "Beyond that, we're not going to comment on the questions or the subject matter or any of that because Erwin and his salon do respect the confidentiality of their customers." The Salahis spent six hours being groomed at the salon in Georgetown before heading to the White House. Gomez and Ioakim went through two rounds of questioning at the courthouse -- first by Secret Service agents and prosecutors, and then in front of the grand jury. Gomez and Ioakim arrived in style, riding in a stretch Hummer limousine that dropped them off at the front of the courthouse. Gomez said he appreciated the opportunity to answer questions in secret. "It was a very good experience, but as an American citizen, I am here to serve my country." Gomez said. After the security breach involving the Salahis, three Secret Service officers were put on administrative leave. Legal experts have said the government might try to prosecute the Salahis for making false statements to the Secret Service, a felony carrying a maximum penalty of five years in prison. That, however, would depend heavily on what the couple told the screeners at the White House that night. Secret Service Director Mark Sullivan told Congress that normal security protocols were not followed regarding the Salahis. As a result of the incident, the White House social office was told to return to a long-standing policy of having White House employees stationed at security checkpoints to help the Secret Service clear up any problems over invitations to state dinners. 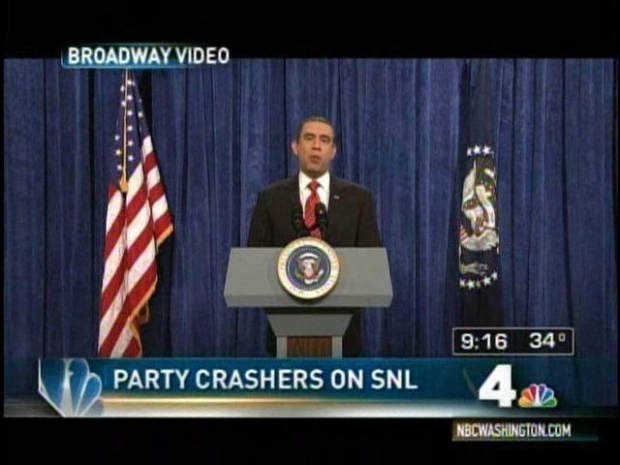 SNL mocked the Virginia couple accused of crashing the White House state dinner. Separately, Virginia regulators are investigating the Salahis' fundraising practices. The couple said money raised through the polo tournament goes to their nonprofit Journey for the Cure. But state officials said the nonprofit didn't register with the state to raise money until November. Subpoenas have been issued for the Salahis to testify before Congress on the Nov. 24 incident. Through their attorney, the Salahis have said they will invoke their Fifth Amendment right to refuse to testify against themselves.